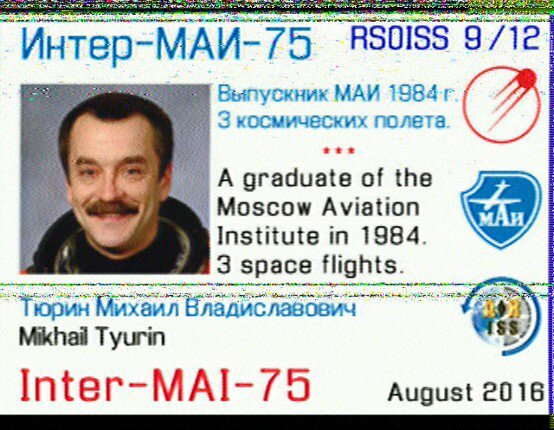 The Inter-MAI amateur radio Slow Scan Television experiment in the Russian Service Module of the International Space Station is scheduled to be activated Jan 30 – Feb 1 on 145.800 MHz FM. Received information that the Moscow Aviation Institute will be conducting their SSTV experiment from January 30 – February 1. It appears from the scheduling that the experiment will only be active during a couple of orbits that overfly Moscow instead of a continuous operation. Rough time periods of activation appear to fall between the hours of 13:00 – 19:00 UTC. Activity should occur on the traditional 145.800 MHz downlink.